There are two potential exhibition invitations that Kristensen and John present to me. At the time of writing they are yet to choose which one will represent Paintings and Sculptures. The invitations are as similar as they are different. Both images provide a useful means of framing the works in the exhibition. The first invitation involves a mottled, quasi-painterly ‘all over’ background, which mixes soft autumnal and loud tones. It sits beneath two black and white photographic reproductions of a clearly modernist ceramic work, the self-reflexive infantilism and primitivism of which suggests the work of Pablo Picasso. 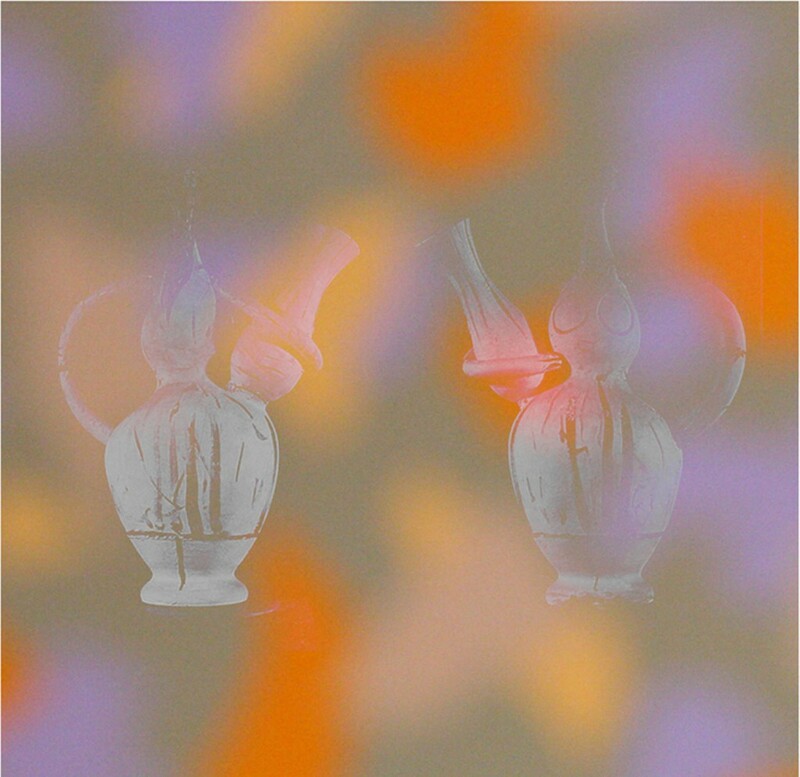 The second invitation involves the same mottled all-over background and the same reproductions, yet here the ceramic pots are ghost-like and receding into the background, unlike the first version where they hold a position of authority. The first invitation might be viewed as representative of a game Kristensen plays with the historical opposition between abstract and representational painting. This game was central to her last series of paintings, entitled Mise en Abyme. In these works the paintings simultaneously evoke the formal language of late modern abstraction (grids, repetitive pattern making, blocks of flat colour), while also engaging an image that strives toward verisimilitude (usually depictions of still life’s sourced from photographic imagery of traditional Japanese flower arrangements). This same juxtaposition is carried out in Christmas Bush. In this painting cleanly defined forms of flat color that recall the lyrical abstraction of David Aspen sit behind a photorealist rendering of an Ikebana floral arrangement of Australian natives. Abstraction in this case appears to be subservient to the image – it is merely a frame, a decorative device. Abstraction is here denied its famous ‘autonomy’, its celebrated drive to silence or rejection of narrative. Instead it is made strange; it is integrated into an illusion and put to use at the service of the image and the narrative it weaves. Yet if we are to use the second invitation as our cue, a contradictory reading emerges. Here the abstract and the representational should be read in synthesis, one disappearing into the other, passing over the same terrain and supporting each other like the flying buttresses in an ogival arch. (The architectural reference seems appropriate, given the architectonic nature of Drumsticks and Hebe). In this sense, Kristensen is particularly succinct in reminding us that contemporary painting need neither explicitly stake a claim to representation and illusion (a return to a school of Old-New Masters), nor need it stake a claim to the purity, essences, and opticalities of abstraction. The anti-narrative and the narrative, the flat and the perspectival, can comfortably co-exist. Either that or Kristensen is making a sly observation about painting, regardless of the guise it takes, being inherently decorative. After all, by the first reading abstraction is reduced to decoration; yet the almost classical subject matter Kristensen integrates into the paintings – still lives from a domestic setting – are also ‘merely decorative’. Both modes of painting are thus captured and ironically leveled within a paradigm of aesthetic pleasure and ornament. Anna John’s work for Paintings and Sculptures can also be understood through the image of the first invitation, though the dialogue here is with sculpture. John marries a formalist, minimalist aesthetic, with an antithetical decorative language (Pole 1 through to Pole 5). Ornate feet ground her minimal vertical structures as they strive to display their own material truth; the object’s austere verticality now juxtaposed against the type of contemporary ‘baroque-kitsch’ we associate with certain domestic interiors. John’s minimalist objects are thwarted; they are irreverently refused the ability to do what a good minimal object does, namely, eradicate any non-essentialist form or meaning. Rather, they are reduced to potential backdrops, to objects of display for seemingly incongruous or superfluous images. 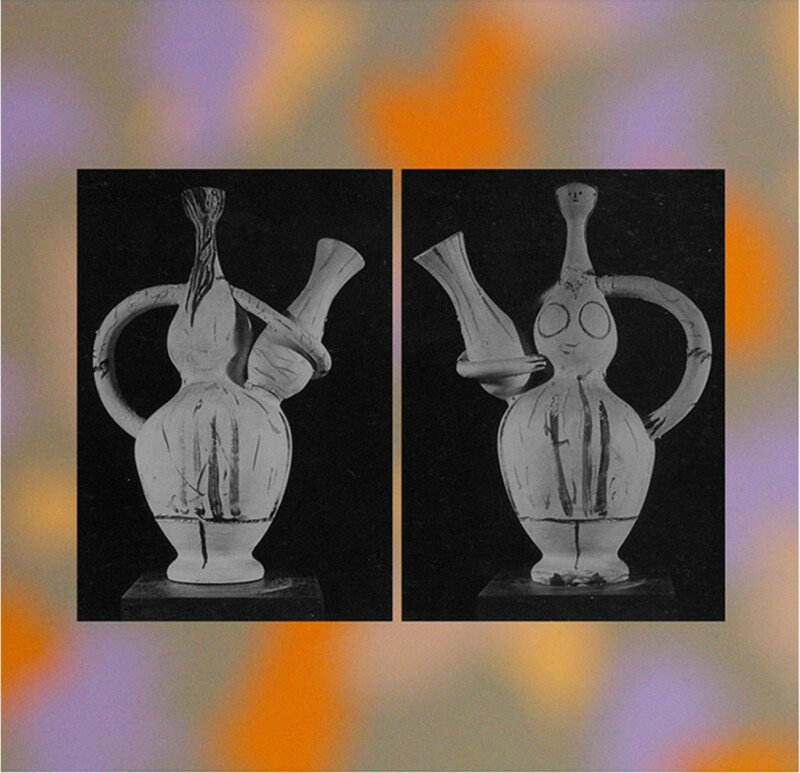 And these images, which depict the ceramic oeuvre of modernist masters such as Picasso and Miro, seem a long way removed from the traditional concerns of minimalism. After all, these images are figurative and anthropomorphic, humanist and sentimental, rounded and sensuous rather than geometric, linear, mechanical or indifferent. A similar hierarchy also evolves from John’s own ceramic works (Chicken Pot, Stick Pot, and Slump Pot). Here her reduced, stripped backed forms are overlaid with curious interventions and characteristics. These include protrusions and slits that remind the viewer of genitalia, of a discourse of the body and of desire that is intentionally absent in the high minimalist drive away from gesture and organic figures. Yet these works are not simply a parody of minimalism. In keeping with the formal democracy of the exhibition’s second invitation, the works are perhaps more interested in recognizing the impotence of dead art-historical divisions. These divisions may include the dichotomies listed above in John’s unusual rendering of the minimalist object, or else other divisions between the flat image and the three-dimensional object; between the art object’s potential usefulness and inherent uselessness; between the art object and its mode of display; or even between painting and sculpture itself. It is interesting in the latter sense that John gives primacy to two canonized modern painters, yet focuses only on their more marginal three dimensions works. Yet the manner in which John’s work most significantly connects to the second invitation is in its evocation of this image’s spectral aspect. John’s work deploys a type of ‘ghosting’, where the past haunts not so much the present but another past. That is to say, where art’s early modernism literally hovers – in faded, degraded photocopies – around art’s late modernism, like an unwelcomed phantom of history that cannot be expunged. Of course, both John and Kristensen’s work extends beyond the all too convenient frameworks these invitation images provide. This framework does not account for either artist’s ambivalent engagement with New Ageism, or Kristensen’s dialogue with the antipodean issue of the centre-periphery, an issue that globalism has made increasingly defunct (her use of Australian native flowers via Japanese arrangements, all depicted through Western abstraction and perspectival systems is perhaps representative of this quixotic issue). Further, this framework doesn’t really account for the divergent attitudes these two artists have toward the value of labor in their work – Kristensen’s being intensive and intentionally labored, John’s being ‘fast’ and more happenstance. Yet these convenient frameworks do offer insight into both artists’ reflexive attitude toward the archive of modernism and its art history, especially the (surprisingly) still relevant division between abstraction and the representational. Still, I would probably lean toward the second invitation image being closer to the heart of these works, which are intentionally ambivalent in their simultaneously loving and critical evaluation of the historical subjects they appropriate.